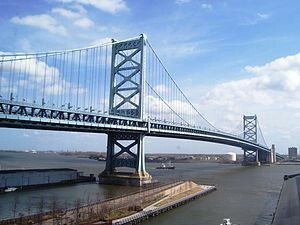 When Pope Francis visits Philadelphia next month, the Secret Service won’t be providing protection along the Benjamin Franklin Bridge, The Philadelphia Inquirer reports. Local law enforcement have been frustrated with planning for the visit because the Secret Service had not made its intentions clear until recently. Security planning will be headed by the Delaware River Port Authority, which has not disclosed its plans yet. But officials said delays and long lines are expected. “What visitors should expect is some type of law enforcement presence on the bridge to ensure those who wish to cross can do so in a safe and expeditious manner,” the Secret Service said in a statement Friday. The bridge is expected to be closed to traffic from 10 p.m. Sept. 25 to noon Sept. 28. Posted: 8/10/15 at 10:12 AM under News Story.